Smell perception in mammals involves the interactions of airborne odorant molecules from the environment with receptor proteins on the olfactory neurons in the nasal cavity. The binding of odorant molecules to the receptor proteins triggers action potentials in the olfactory neurons and results in transmission of information to the brain. Mammalian genomes typically have approximately 1,000 functional odorant-receptor genes, each encoding a unique odorant receptor. (a) Describe how the signal is transmitted across the synapse from an activated olfactory sensory neuron to the interneuron that transmits the information to the brain. (b) Explain how the expression of a limited number of odorant receptor genes can lead to the perception of thousands of odors. Use the evidence about the number of odorant receptor genes to support your answer. It is given that odorant molecules are binding to receptor proteins on the olfactory neurons and triggering action potentials. These action potentials are then transmitting information to the brain. Even if you don’t quite remember all the steps involved in olfactory transduction, that’s fine. Read carefully and you will see that part A is asking you what happens at the synapse to get information from an activated olfactory sensory neuron to the interneuron. Remember that “information” is passed in the form of neurotransmitters. Some students recalled that neurotransmitters are released into the synaptic cleft but failed to mention a critical step, which is the binding of those neurotransmitters to receptors on the postsynaptic membrane. To get full credit for this portion it was necessary to state that neurotransmitters are released from the olfactory neuron and bind to the receptors on postsynaptic neurons. The statement tells us that mammalian genomes have about 1,000 function odorant-receptor genes encoding a unique odorant receptor. Remember that odorant-receptors genes = DNA and odorant-receptors = proteins. So how can 1,000 genes make receptor proteins that can recognize thousands more odors? Since we know that each gene encodes a specific receptor, one possibility is that an odorant molecule can be recognized by more than one odorant receptor. Similarly, one receptor can bind to more than one odorant molecule could also be an answer. Oftentimes in class you may draw receptors and neurotransmitters (ligand) using the lock and key model. It is important to note that more than one ligand can be recognized by the same receptor, although maybe at varying degrees! 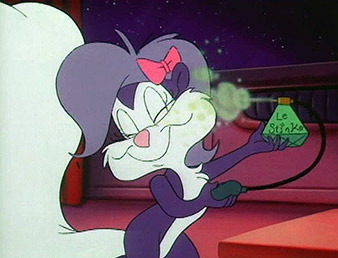 Thus, the combination increases the number of detectable odors. Another explanation would be that different odors could activate different combinations of neurons whose signals are integrated by the brain to perceive different smells. Thus the multiple interactions of neurons in the brain can result in recognition of thousands of odors. A more advanced mechanism would include alternate splicing where one gene transcript can get spliced in different ways to produce more than one mRNA. This mRNA in turn can be translated into different proteins. This would lead to many combinations of receptors that could be produced from the same gene. This question tests the conceptual knowledge about how a stimulus, like odorants, can generate a sensation that is then interpreted by the brain into a perception, like smell. The same basic principles can be applied to all the different types of sensory perception so let’s review how a stimulus generates an action potential. External stimuli, such as heat, light, and chemicals, and internal stimuli, such as blood pressure and body position, are all forms of energy. This energy is converted into changes in membrane potential of their respective sensory receptors by opening or closing ion channels on the sensory receptor’s plasma membrane. This change in membrane potential is known as a receptor potential. These receptor potentials are graded and their magnitude varies with the strength of the stimulus. A stimulus such as an odorant can bind to odorant receptors triggering a signal transduction pathway involving a G protein, adenylyl cyclase, and the second messenger cAMP. The second messenger opens ion channels in the plasma membrane that are permeable to Na+ and Ca2+ causing an influx of these ions. Once a stimulus has been transduced into receptor potentials, action potentials can be sent to the central nervous system if a certain threshold is met. When a neuron is not being stimulated, it remains in its resting state where there are more sodium ions [Na+] outside the cell and more potassium ions [K+] inside the cell. If a stimulus opens K+ channels the inside of the membrane becomes more negative resulting in hyperpolarizations. If Na+ channels open, an influx of Na+ causes a depolarization where the inside of the membrane becomes less negative. If a stimulus is strong enough to produce a depolarization that reaches the threshold, an action potential is triggered. During the rising phase of an action potential Na+ influx makes the membrane more positive but during the falling phase Na+ influx is blocked and K+ channels open allowing efflux of K+, making the inside of the cell negative again. 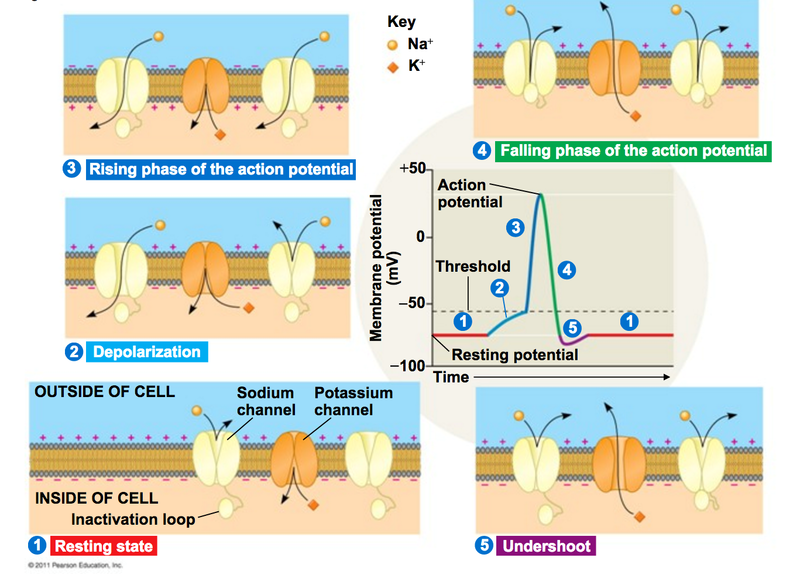 Since K+ channels close slowly, too much K+ leaves and results in an undershoot which is corrected when Na+ channels open the membrane returns to resting potential. Remember that during the undershoot another axon potential cannot be triggered. This is called the refractory period and sets the maximum frequency at which action potentials can be triggered. Since many sensory neurons spontaneously generate action potentials at a low rate, a stimulus does not switch the production of action potentials on or off but rather modulates the frequency at which they occur. Action potentials are conducted along the length of an axon in one direction toward the synaptic terminal. 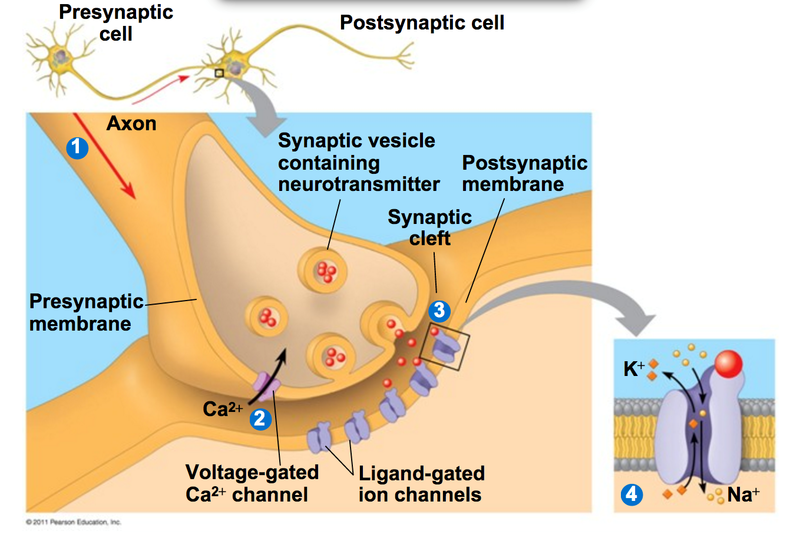 Once the action potential reaches the synaptic terminal it opens voltage gated Ca2+ channels allowing Ca2+ to enter. This causes synaptic vesicles to fuse with the presynaptic membrane and release neurotransmitter into the synaptic cleft. The neurotransmitter binds to the receptor portion of the ligand-gated ion channels in the postsynaptic membrane and opens them. This allows a change in the membrane potential of the postsynaptic cell causing either excitatory or inhibitory postsynaptic potentials. These postsynaptic potentials are graded potentials that can either excite or inhibit action potentials. All of the receptor and postsynaptic potentials are integrated through summation and create a pattern of activity that passes through different parts of the brain to perceive the sensory information. Need help studying for AP Bio?